The Eleaf iStick leather case is designed for iStick 20W and 30W battery to avoid abrasion. All the corresponding button positions are marked correctly on the leather case. Perfect to carry your iStick MOD. • It's specially cut for 20W iStick and 30W iStick. • There are Eleaf logos printed on front side of the lanyard and both sides on the leather case. I am very pleased with this product. It is especially good for when you are driving and the lanyard means you have full control of your car,instead of trying to hold the steering wheel with your e-leaf in your hand.Also usefull when doing housework or Gardening. It is always with me around my neck. Very Good. I hope you continue to sell these for the I-stick. 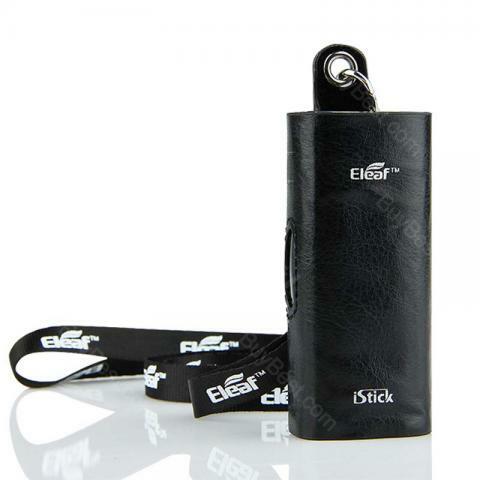 20W Eleaf iStick Leather Case with Lanyard is a leather case made of high quality and very durable. It is a 20W power.